(Card on left) - "Valentine you're the ONE." (Card on Right) - "...that beat as one!" 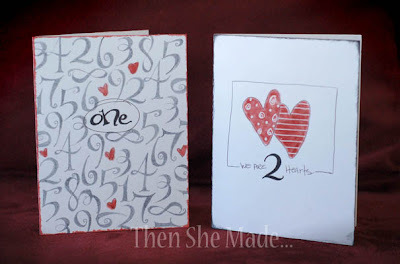 Both card were made just by folding a piece of white cardstock in half and decorating the front with stamps. Pretty easy! Ok, stayed tuned! I've got a fun Valentine decor project that uses brown shipping paper lined up for tomorrow's tutorial.